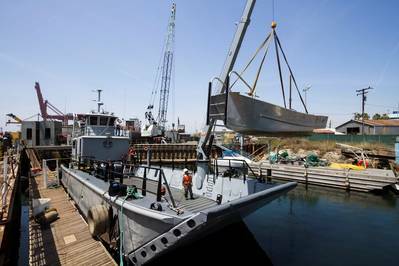 Port of Long Beach officials welcomed a new addition to their small fleet of boats this week with the delivery of a refurbished and retrofitted landing craft that will strengthen their emergency recovery capabilities. 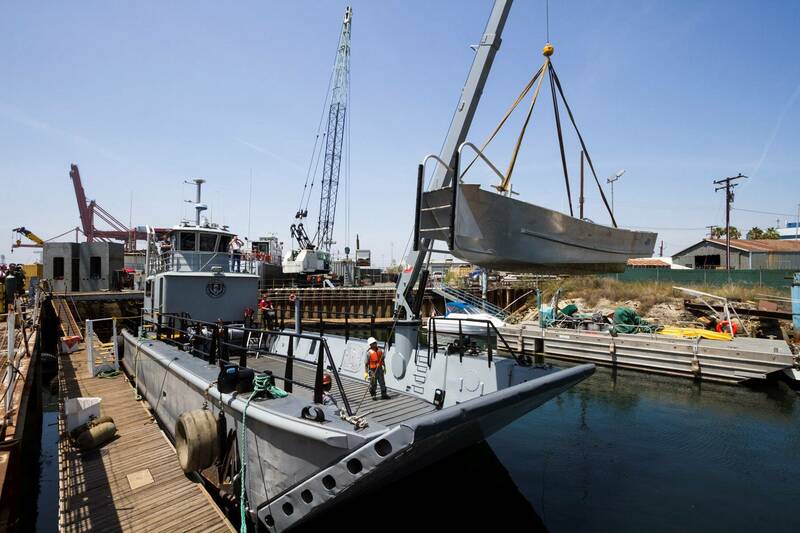 Donated to the Port by the U.S. Defense Logistics Agency, the Landing Craft Mechanized Mark 8, or LCM-8 underwent 12 months of renovations to add cleaner engines, a salvage crane and a galley. The renovations cost $1.5 million and were primarily funded by the California Port and Maritime Security Grant Program. This versatile craft will mainly be used by the Port’s Security Division in support of disaster recovery operations and as the primary launch platform for the division’s dive team and multi-agency dive training. A hydraulic system with an 8-ton crane is mounted to the side of the vessel. The crane can be used to pluck vehicles out of the water and lower them into the well deck. One of the hallmark features of the LCM-8 is the “drop-down ramp.” This ramp can be lowered to allow emergency vehicles to drive from land directly onto the boat and back out again in case of a natural disaster that makes roads and bridges impassable. As the only port on the West Coast with this kind of vessel, the Port of Long Beach continues to lead in the development of business continuity and port resiliency capabilities.